In Italy you would not necessarily see the sort of Bolognese sauce we serve up here in Australia. This sauce at its most basic is onion, garlic, dried basil, beef mince, tomato and seasonings all boiled up together and served over spaghetti. 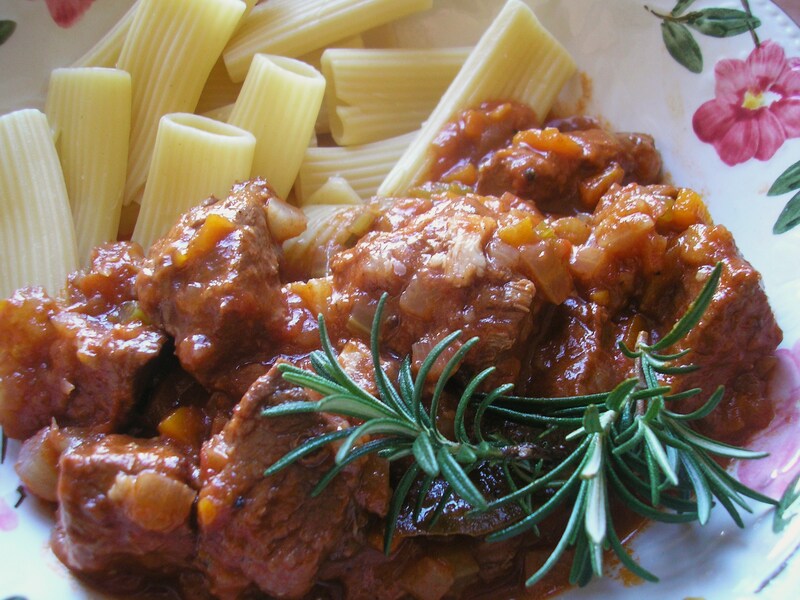 Some people may add diced carrot and celery to the mix but it is still quite different in texture to the meat ragu style sauces that would be served in an Italian trattoria or home kitchen. 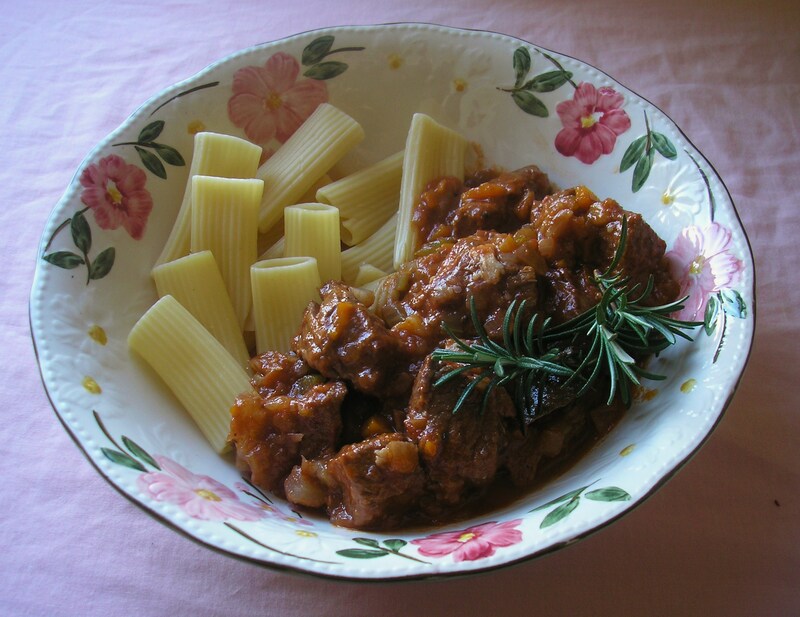 In Italy mince would not be used and the ragu could include any meat from beef to veal or duck. I like to serve my ragu with rigatoni instead of the usual spaghetti as the large holes in the pasta tubes are good for trapping the rich sauce. Finely dice the onion, fennel, celery and carrot. Chop the bacon or pancetta. Dust the meat with the flour. Heat some of the oil in a large heavy based saucepan. Brown the meat in batches. Remove and set aside. Add a little more oil to the pan and gently fry the onion, fennel, celery, carrot, bacon and garlic. Add the dried oregano, bay leaf, all spice, orange zest and tomato paste. Fry for 1 min. Add the red wine and cook for a further 2 mins. Add the tomatoes, beef stock and 1 cup water. Return the meat to the pan and season with pepper – don’t add salt at this point as the bacon and the beef stock can be salty, you can adjust your seasoning to taste at the end of the cooking time. Bring to the boil, cover and reduce to a low simmer. Cook for two hours stirring occasionally. When the beef is almost falling apart, remove lid and reduce sauce for 15 mins. Make sure there is still plenty of sauce. Serve over rigatoni or large penne pasta. Dried beans are the most versatile, cheap and easy ingredient to use. Many people are put off by the fact that they need to be soaked in cold water overnight before they are ready for cooking. This is just a matter of a bit of forward planning, it certainly doesn’t present any real difficulty. You can substitute canned beans but I find the dried ones, cooked from scratch have a lot more flavour. One of the most famous bean dishes is the French cassoulet – a long slow cooked casserole of haricot beans, pork and duck confit among other things. Stephanie Alexander’s recipe contains five different cuts of pork and twelve confit duck legs along with the essential haricot beans. I would not suggest it as a budget recipe. I often use red kidney beans to a make Mexican chilli that can be served with burrito tortillas or tacos and a couple of sides such as guacamole, salsa, sour cream and cheese. These are cheap, easy and filling. 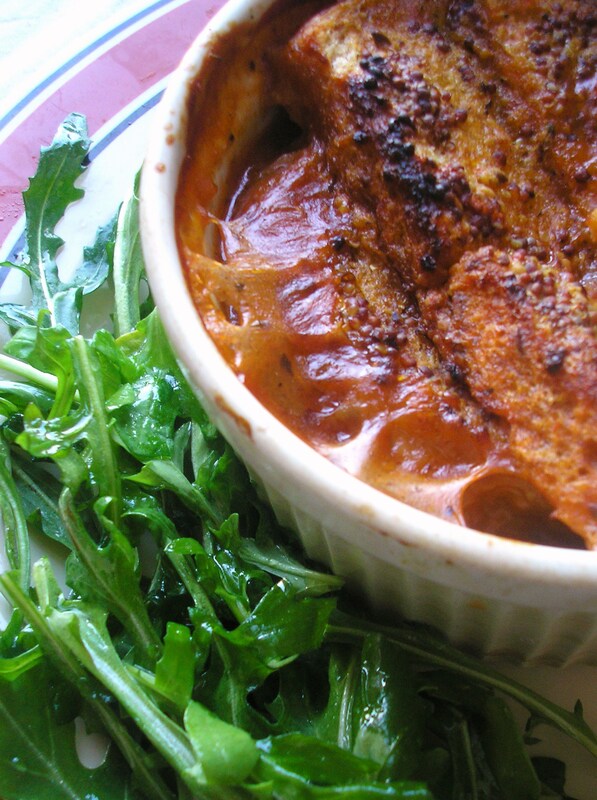 Another bean dish I like to make is Boston Baked Beans. 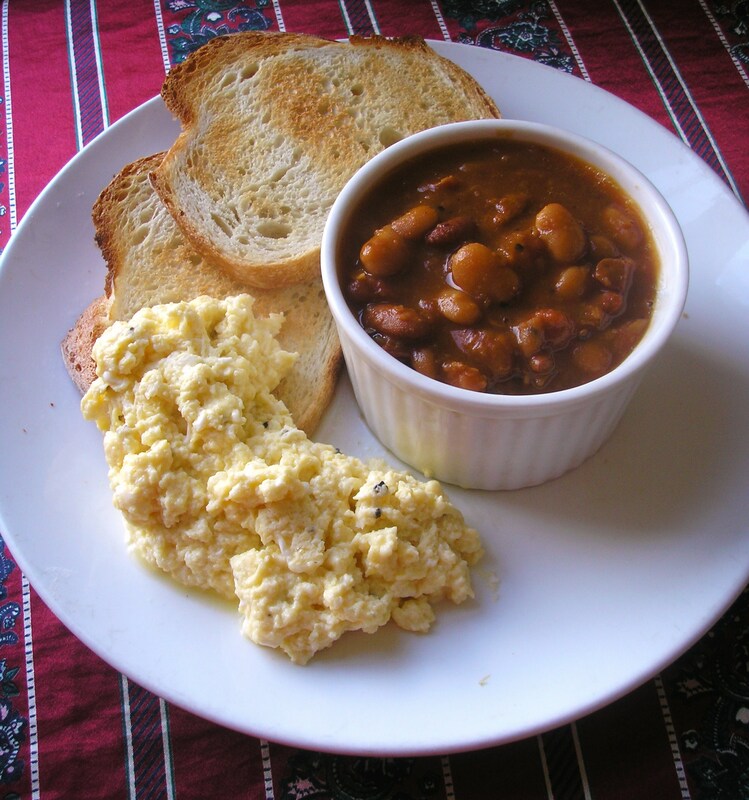 These are delicious sweet, tangy slow cooked beans that I would usually serve with eggs as a breakfast dish. This works well as the beans are best made the day before and stored in the fridge overnight to develop their flavour. The next morning all you have to do is gently warm them while you are cooking your eggs. Leftover beans can be frozen. Pour beans, along with their soaking water, into a large pot. Bring to the boil and simmer gently for 45 mins – 1 hour or until beans are tender when pierced with a fork. Drain, reserving the cooking liquid. Gently fry the onions in the oil until translucent. Add all other ingredients including the reserved cooking liquid. Add a little water if there is not enough liquid to cover the ham hock. Cover and simmer gently on the stove top for two hours. If the ham hock is tender, remove from pot. Discard the fat and bones and shred the ham, set aside. Cook the beans for a further 45 mins uncovered, allowing the sauce to thicken and reduce. Add the ham and simmer for a further 15 mins. Love him or loathe him there is no doubt that Heston Blumenthal has a passion for food. When he is testing for his television series – sampling such gut churning ingredients as bulls testicles and lamprey spinal chords – he may be considered the culinary equivalent of Man Vs Wild’s Bear Grylls but he is not all about shocking his viewers. I first became interested in him because I have an abiding interest in food history. Obviously Heston does too, remember the cockentrice, a mythical meat monster that might have been quite at home on Henry VIII’s table or the ‘meat fruit’ made from the aforementioned bulls testicles – feminist academic Germaine Greer appeared to enjoy eating these a little too much! It seems that Royal courts and aristocratic households of the past liked a joke. Food was theater and due to the large number of servants the upper classes maintained they were able to create this sort of food trickery on a regular basis. When I approached the idea of cooking one of Heston’s dishes myself I was looking for something a little more accessible so I thought I would give his thrice cooked chips a go. He uses Maris Piper potatoes which are readily available in the UK but impossible to find here in Australia. I did some research and found that the closest approximation here was the good old Desiree that is available in every supermarket these days. The chips were a bit of a process but I can honestly say that the resulting chips were the best I have ever tasted. 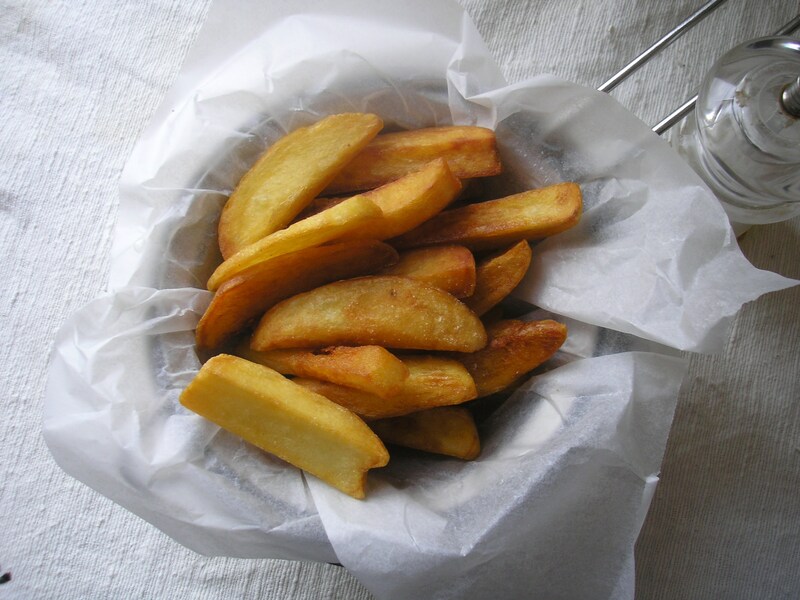 Wash and peel the potatoes, then cut them into chips about 1.5cm thick. When cut, place them in a large bowl for 2-3 minutes under cold running water to rinse off some of the starch. Drain. Bring a large saucepan of salted water to the boil, add the chips, bring back to the boil and then simmer until the potatoes are soft. It is important to make sure the simmer is gentle so that the potatoes don’t start to fall apart before they are cooked through. Using a slotted spoon, carefully lift the potatoes out of the water and place on a cake rack. Leave to cool and then put in the fridge until cold (the dry air of the fridge removes excess moisture from the chips via evaporation). Pour enough oil to cover the chips into a deep-fat fryer (or, if doing in batches, enough to cover the chips in a wok) and heat it to 130c. A good way to check the temperature if you don’t have a thermometer is to insert the handle of a wooden spoon into the oil, if bubbles form around the handle the oil is hot enough. 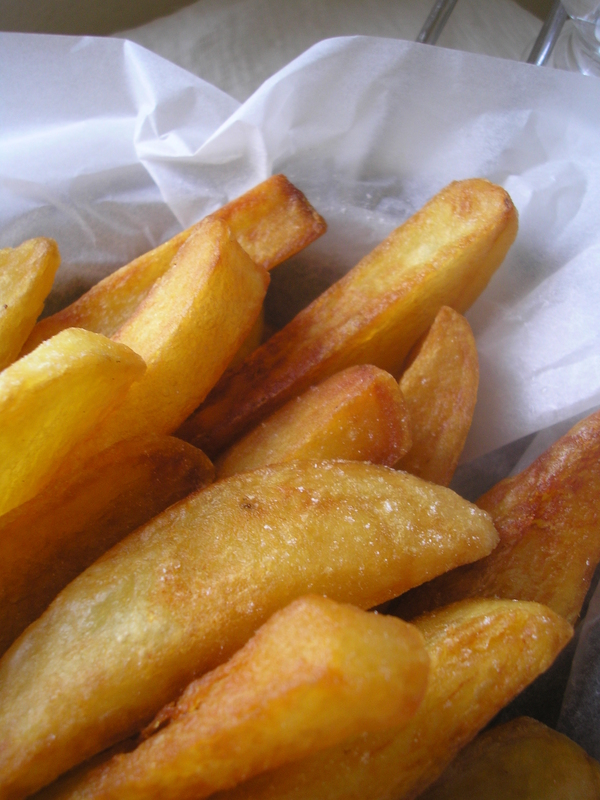 Plunge in the chips and allow them to cook until they take on a dry appearance and are slightly coloured. Remove the chips and drain. Allow to cool on a cake rack then return to the fridge until cold. Reheat the peanut oil to 190c (I just made it a little hotter than the earlier frying, you can test by observing the ferocity of the bubbles around the wooden spoon handle). Plunge in the chips and cook until golden brown. This may take about 8-10 minutes. Season with sea salt and serve immediately.